Year round log home with gorgeous mountain and lake views. Access to private waterfront for swimming and boating. Master bedroom with queen bed and private bathroom, second bedroom with double bed next to full bath with jacuzzi. Living room with futon couch which opens to a double bed. Full basement living area , cable TV and direct walk out to garden. 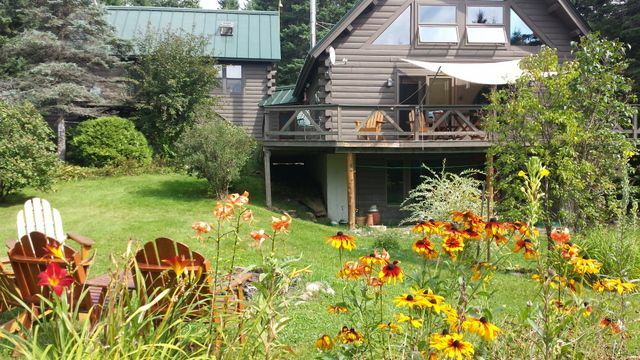 Short distance to private swimming and boating area and minutes to Saddleback Ski Center. Kathryn S.Where do you live? Beautiful comfortable home, wonderful sunset views from the deck. We really enjoyed the fire pit, roasting marshmallows and making Smore‘s at night under the stars . Spacious property. Great location. Close to all the action. Clean and tidy. Would love to stay there in the winter! An awesome rental property you will not be disappointed. Great place to stay for skate skiing and snowshoeing adventure!! Rhank you for the kind review. Hope you'll visit again! We would rent again here in a heartbeat ! Beautiful home. Neat, comfortable, had everything we needed. Larrain's communication was very good and the home and experience met our high expectations. If we are spending a few days in Rangeley again - we would stay here again! An absolutely lovely getaway with plenty of privacy and everything we needed to be comfortable for our weekend stay. Larrain and Rob were wonderful and easy to reach when we had a question. We look forward to staying here again!